tt takes a younger person to point somebody like an old Granny in a new direction and get them using their dusty old braincells in a focussed fashion. After all, most of the time, those brain cells are moseying around the garden and maybe dipping into the easy crossword. But they do get the chance to recharge themselves a bit during meditation. I only know this is happening when they are presented with something new, something a bit more challenging and I see that they can rise out of their dusty retirement and dance with vigour at the sort of conversation which my Singapore boy sent me the link to. So gripped were we, Grandpa and I, that we sat on at the breakfast table, ignoring the newspaper and the post, sipping our coffee and watching each other as those brain cells got into action. You could join this conversation too if you click on the link to the YOUTUBE recording of one Jordan Peterson, a Canadian clinical psychologist with a special interest in the psychology of religious and ideological belief and said to be right wing. I also discover him to be a philosopher with a following who eats only steak. 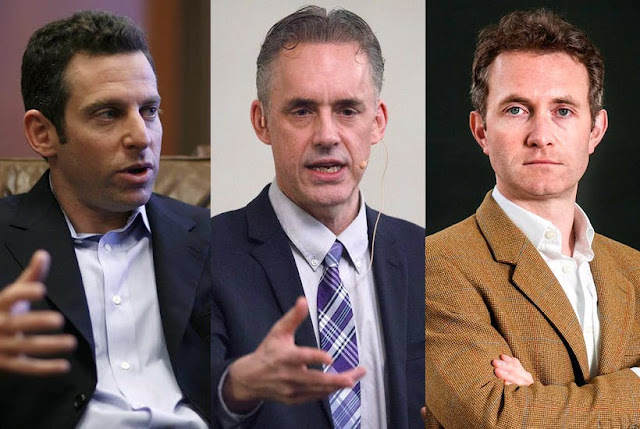 He is in conversation with and occasionally gets really cross with one Sam Harris, American professor and philosopher and critic of religion who I hadn’t heard of before this and then there is a considered English moderator, author and political commentator Douglas Murray who confesses to being an atheist but a cultural Christian.